If you have never owned sterling silver, you probably aren't aware it requires special cleaning. Silver tarnishes. Sterling silver consists of 92.5 percent pure silver along with 7.5 percent alloy metal. Pure silver is quite soft in its pure form and as such is too soft for realistic use in jewelry or flatware. Alloy is added to make it stronger. Silver metal oxidizes over time. Consequently, jewelry and other items created out of this metal must be stored in tarnish-proof cloths or put in drawers lined with tarnish-opposing strips. 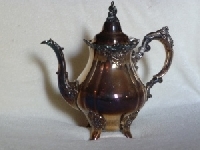 Tarnish is discoloration occurring in metal. Silver changes color naturally over time, from a yellowish hue to a concentrated yellow and on to black. The tarnishing process occurs when this metal comes into contact with items containing hydrogen sulfide. Items derived from fossils and latex gloves and paint all contain substances that result in tarnishing. Even contact with onions and eggs exacerbates the tarnishing process. Some recommend using white toothpaste. When there is only one small piece to clean, use toothpaste. Dab a bit on your finger and rub into the tarnished metal. If an entire sterling collection tarnishes, use baking soda. Create a paste out of water and baking soap. Dab a sponge into the paste and rub the paste-soaked sponge onto the discolored items. If the items are black, allow the paste to remain on the pieces for 60 minutes. Wipe clean, rinse in water and dry, using a supple cloth. On the other hand, not all jewelers agree with this approach, maintaining baking soda and toothpaste are too abrasive for use on this type of metal. They recommend using a special polish. Another option is a chemical dip, which is quick. It's effective on badly tarnished items. Get a professional restorer to do this for you. Using too much dip can ruin the metal causing corrosion and pitting to occur in the metal. If you do this yourself, wear gloves and read the directions. Clean the silver items early on in the tarnishing process for best results. The process begins with a slight color alteration and then progresses to yellow patches or spots. Using a detergent that does not contain phosphate-based chemicals is okay. If you don't catch the process in the nick of time, the items may have already turned dark brown or black. Silver polishes can be used to remove these stains from flatware and jewelry. The two types of polishes available include those that remove tarnish and a second kind that removes both tarnish and provides protection against future tarnishing. Sometimes the latter polish is too coarse and harsh. Polishes that wash off are gentler on the metal than those that are put on and left. If a polish has elevated degrees of abrasiveness in it it is better suited for silver cutlery than jewelry. Do not wear this metal into chlorine water or while handling ammonia or bleach. These chemicals effect the finish. Do not touch silver when your hands are oily. This, too, prompts the tarnishing process. When living in a high humidity area, sliver tarnishes quicker than it would be a low humidity area. Old, dried up silver polish is not good. It is too harsh and destroys metal. When drying this metal, never use paper towels or tissue paper because they can scratch silver. When taken care of, silver takes on a lush finish.